The Gallatin Range runs from Bozeman, Montana, south to Mount Holmes, Wyoming, for a total length of about 75 miles. It’s primarily a Montanan range, though significant parts lie in Wyoming. More than half of the range lies in Gallatin National Forest, though its southern portions lie in the northwestern quarter of Yellowstone National Park. It’s bounded on the east by the Yellowstone River. Lewis and Clark named both the Gallatin River and the Gallatin Range after Albert Gallatin, the longest-serving Treasury Secretary in United States history. If you ever win money on a game show with that fact, I want a cut. The Gallatin Range makes up the northwestern part of the Absaroka-Gallatin volcanic field, and its features are largely volcanic in origin. The volcanism also gives the range an extensive petrified forest, whose trees were petrified as a result of lava and ashflows about 50 million year ago. Surprisingly, you’re allowed to take one small piece of petrified wood from the forest each year with a permit from the Gallatin NF office. The range provides an important part of the extensive wild lands that make up the Greater Yellowstone Area (or Ecosystem). Both inside and outside the park you can see the Yellowstone group of wildlife, including grizzly bears, wolves, and wolverines. The terrain will be familiar to Yellowstone climbers, with grasses and sagebrush at lower altitutdes, Douglas-fir and Engelmann spruce higher up, and alpine tundra on the peaks. The Southern Gallatins lie inside Yellowstone National Park. Most of this part of the range is protected as de facto wilderness, but not formally designated as such. Several lower peaks make good day trips from park centers such as Mammoth Hot Springs. These include Sepulcher Mountain, a 10-12 mile hike with 2200-3400 feet of elevation depending on route; and the very popular and easy Bunsen Peak. Aside from such examples, most of the peaks in the southern part of the range work best as two or three day trips. Hike in to a base camp on the first day, ascend on the second and then hike out that day or spend a second night at base camp before returning. Electric Peak and Mount Holmes, for example, are typically hiked this way. There are also multi-day peakbagging trips in the far northwest part of Yellowstone NP such as the Skyline Trail. The Southern Gallatins also come with important use restrictions because most of the region is part of a Bear Management Area (BMA). The BMA is closed to off-trail use for about half the year (see "Red Tape" below). At the northern end of the range, the Gallatins are dark and broad, consisting of long ridges of exposed volcanic rock, the remnants of lava flows millions of years ago. Quite often, the ridges are sheer on either side and very rugged across their tops, and many a climber has found enjoyable scrambling along those ridgelines. Mount Bole and Mount Chisholm, at 10,333' each, are the highest peaks in the northern Gallatins. There are several other named summits over 10,000'-- Blackmore, Elephant, Divide, Hyalite, Fridley, and Overlook-- and quite a few unnamed ones, most of them not having enough prominence to qualify as official peaks but nevertheless having their own distinct features and qualities. Less heralded but still impressive are the peaks between 9000' and 10,000', many of which are high enough and/or rugged enough to be bare of trees on their summits and upper ridges. The northern Gallatins probably see more mountaineering activity than the other parts of the range do. This is because they are close to a major population center (Bozeman), are accessible by good trails, and do not have the red tape that close much of the southern Gallatins. Winter access to trailheads, though not beyond them in most cases, is possible via snowmobile. Access to this part of the range is principally from the north via Hyalite Canyon; approaches from the west are long, and from the east they are often blocked by private property (the easiest routes to Fridley Peak and Mount Chisholm, for example, are closed to public use). Hyalite Canyon is a short drive south from Bozeman and has three trail systems that access the high peaks. The Blackmore Trail climbs Mount Blackmore and also offers the easiest approach to Elephant Mountain. Hyalite Creek Trail reaches Hyalite Basin, where one trail climbs Hyalite Peak and another reaches Squaw Creek Divide, which lies just south of Divide Peak (an excellent outing is to use these trails and the ridges to make a traverse between Hyalite and Divide Peaks). East Fork Hyalite Trail leads to Heather Lake, which sits directly beneath Mount Chisholm and Overlook Mountain. Longer outings are, of course, possible, and some hardy backpacker-scramblers make the two- or three-day traverse of the ridge system enclosing Hyalite Canyon. Hyalite Canyon is not just for hikers and mountaineers; it also attracts backcountry skiers and ice climbers. There are numerous bowls and couloirs appealing to the former and waterfalls appealing to the latter. The canyon is also popular with people on mountain bikes and motorbikes. The U.S. government did well many decades ago in buying from or trading with landowners in order to keep most of the Gallatins as contiguous public land. Because there have been no formal wilderness designations in the northern Gallatins to date (see "Wildernesses," below), wheeled usage continues to be permitted on some of the very popular trails. Wheeled use is restricted to certain months and certain days of the week (see "Red Tape" below). Because the Northern Gallatins lie near Bozeman and Livingstone, expect to see significant traffic from local residents. The region's hunting, fishing, and rafting possibilities add to the activity level in season. Many thanks to Bob Sihler for this section of the page - - and for many of the great photos highlighted throughout. The Gallatin Range consists of large tracts of roadless, wilderness-quality lands. Because it stretches north out of Yellowstone, the range provides an important corridor that connects habitat in northern Montana (Glacier NP and the Bob Marshall Wilderness Complex) with the Greater Yellowstone Area. Federal land management provides various ways of protecting such wildernesses. 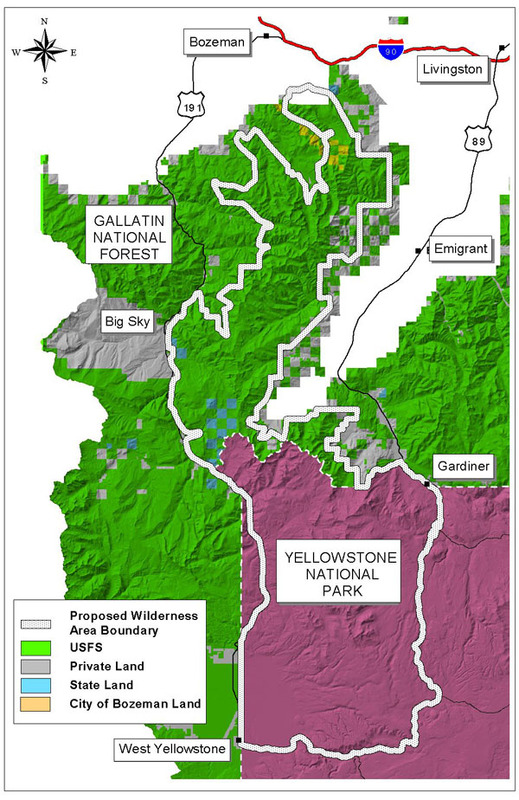 The portions of the Gallatin Range that lie in Yellowstone NP would certainly qualify as a federal wilderness area. Unfortunately, many managers in the National Park Service have a tradition of opposing wilderness designations in the national parks because the wilderness overlay takes away NPS discretion over how it manages its lands. The NPS also claims that wilderness protection is unnecessary because national parks already enjoy substantial protection, but the tourism development at Old Faithful, Yosemite Valley, and many other places would suggest otherwise. National forests may also have formally designated wildernesses or “temporary” designations such as roadless areas and wilderness study areas. A roadless area obviously lacks roads, and it is supposed to be managed in a roadless state until it can be studied for possible designation as wilderness. The next level of protection is a wilderness study area, a roadless area that is formally being studied as wilderness. Because wilderness designation requires an act of Congress that usually becomes politically controversial, many wilderness-quality lands remain under temporary protection as roadless areas or wilderness study areas. That’s where matters stand in the Gallatin Range today. It has three roadless areas, the Gallatin Divide Roadless Area, the Gallatin Fringe Roadless Area, and the Hyalite Roadless Area. Together, they make up the core of 202,000 acres of potential wilderness. Of that land, 151,000 acres enjoy ongoing protection as the Hyalite-Porcupine-Buffalo Horn Wilderness Study Area, created in 1977. Off-road vehicles such as motorcycles and snowmobiles are still allowed in this WSA, as well as other parts of the Gallatin Range outside Yellowstone. See Bob Sihler’s Mount Chisholm page for the mixed-use rules around the Hyalite Lake trailhead, for example. You can find a map of the proposed Gallatin Wilderness here. Wilderness groups, hunters, and off-road vehicle users have mobilized around the wilderness designation issue. Climbers and hikers should certainly make their opinions known too. The Gallatin Range falls naturally in two halves, the Southern Gallatins consisting of those peaks inside Yellowstone NP, and the Northern Gallatins north of the park. The Northern Gallatins include a subrange, the Hyalite Peaks, which I will follow here. The Gallatin Range has pretty thin coverage on SP. For that reason, I’ve sorted the peaks according to whether they have an SP page or not. Because the range has one sub-range, the Hyalite Peaks, I’ve also pulled those out as a separate group (with duplication for Hyalite Peaks with an SP page). Electric Peak is the highest peak of the Gallatins, and the most prominent peak in the northwest corner of Yellowstone National Park. Dominating the view from Gardiner and the surrounding area, the peak is often mistakenly believed to be the highest point in Yellowstone, but it is only the eighth highest summit in the park. Although much of the mountain and its common approach route lie in the state of Wyoming, the actual summit lies just over the border in the state of Montana. Located in the northwest region of Yellowstone National Park, Mount Holmes anchors the southern end of the Gallatin Range. With an elevation of 10,336 feet, Mount Holmes is the third highest peak in the range. On the summit is a small stone/wood shelter which serves as one of three primary fire lookouts located within Yellowstone. During the summer months the lookout is manned by a park employee. Tied with Mount Bole as the highest peak in the Northern Gallatins, Mount Chisholm's summit is blessed with great views of the Madison, Gallatin, Bridger, and Absaroka Ranges. Hyalite Peak is a popular mountain overlooking Hyalite Basin. Located, not surprisingly, in the Hyalite Range, it can be climbed by itself or as part of a traverse with Divide Peak. In the Hyalite-Porcupine-Buffalo Horn Wilderness Study Area, Ramshorn Peak is most easily reached from the Buffalo Pass trailhead. Overlook Mountain, well, overlooks Emerald and Heather Lakes in the Northern Gallatins. It also provides the easiest way to access Mount Chisholm. Because it's near the eastern edge of the range, the summit provides views along the length of the northern Gallatins, the Absorakas, the Madison Range, and the Bridger Range. This is another peak in the Northern Gallatins that sees quite a bit of use because of its proximity to Bozeman. Below the peak is Hyalite Canyon, a local hangout for climbers. In the Hyalite Range, Elephant Mountain is accessible from the Blackmore trail. bigsky801 reports that the Forest Service is now plowing the Hyalite Canyon Road to Grotto Falls, providing good winter access. Divide Peak lies roughly in the center of the horseshoe-shaped ridge that makes up the Hyalite Peaks. Though a walk-up from Squaw Creek Divide, it can also be climbed as part of the Hyalite Ridge Traverse. Named after one of the world's great climbers, Alex Lowe Peak stands above Cottonwood Canyon in the northern Gallatins. It's fairly isolated, but spectacularly visible from Elephant and Blackmore. A grass-covered peak, easily accessible from the Bozeman and Livingston area. It's in the Northern Gallatins, about half-way from the Hyalite Peaks and the Southern Gallatins in Yellowstone National Park. With Electric Peak, Sepulcher Mountain dominates the Gardiner skyline to the south. With walk-up trails from the south and east sides, and several choices of connector trails, it makes for a good loop hike out of Mammoth Hot Springs in Yellowstone NP. Easily visible from the tourist areas around Mammoth Hot Springs, Bunsen Peak is a short walk-up of about 1300 feet in two miles. Like Sepulcher, there are two different trails up, giving you a good loop option. There are also connector trails to Osprey Falls and down to Mammoth. Garnet Peak offers several trails to its summit. There is a fire tower on top because of its great views of the surrounding country. Unfortunately, the tower is closed to the public. Visible off to the left as you enter Yellowstone NP from Gardiner, Rattlesnake Butte is a short walkup. There's no established climber's trail that I've found, with moderately-annoying scree-filled slopes on the approach. After the exposed south-facing approach, the shady trees on the summit are pleasant but limit the views. The Hyalite Peaks is a subrange in the Northern Gallatins. This list consists of only the major Hyalite Peaks, and duplicates information in the main list above. Once again, I'm grateful to Bob Sihler for help building the list. This section is still under construction. Help is gratefully accepted. There are two groups of Yellowstone trailheads into the Gallatins. On the east side of the range along the Grand Loop Road you'll find a series of trailheads. There are day tripping opportunities over here. On the west side on Highway 191 you will find access to backpacking trips, with trails that connect up to the east side network. I've arranged all these from north to south. These are the most popular trailheads for access to the Gallatins inside Yellowstone NP. Mammoth Hot Springs. Park above the gas station if you can. The trailhead is just below the hot spring terrace provides access to the Sepulcher Mountain Trail. It links to Snow Pass and thus also to Bunsen Peak the long way. This is also the trailhead for the Beaver Ponds Trail, a very popular tourist loop. Snow Pass. On Highway 89 (Grand Loop Road) in Yellowstone NP just south of Mammoth Hot Springs Upper Terrace. This trailhead provides an alternative route up Sepulcher, or access to the Fawn Pass Trail for Electric Peak and points beyond. Glen Creek/Bunsen Peak. On Highway 89 (Grand Loop Road) in Yellowstone NP just south of Golden Gate. Above the parking lot lies Bunsen Peak. On the other side of the highway, the Fawn Pass Trail provides access to Sepulcher Mountain, Electric Peak, and points beyond. Indian Creek. Located at the Indian Creek campground with connections to several skiing trails in winter. In summer, it provides access to the Bighorn Pass Trail through the heart of the BMA (see “Red Tape”). Mount Holmes. Located just past the Apollinaris Spring turnout, this trailhead provides access to the Mount Holmes Trail and, you guessed it, Mount Holmes. Grizzly Lake. Past Obsidian Cliff, the Grizzly Lake Trail provides alternative access to the Mount Holmes Trail, adding a little distance and a little elevation. Highway 191 lies mostly outside the park on the west side, but several of the trailheads are within Yellowstone NP so park rules apply. These trailheads get significantly less use than those in the park. You can build shuttle hikes from the trailheads inside the park, but these involve quite a bit of driving because there is no road through the southern Gallatins. If you’re staying overnight in the backcountry, you have quite a bit of driving to get your permit in the park before coming back out here. Snowflake Springs/Tepee Creek. Just outside the northwest boundary of Yellowstone NP on Highway 191. This provides access to Tepee Pass and to the Sky Rim Trail and ultimately Big Horn Peak. Daly Creek. On Highway 191, at the north end of the western boundary of Yellowstone NP. The Daly Creek Trail has connections to the Sky Rim Trail and Big Horn Peak. Black Butte. On Highway 191, inside the park. It provides access to the Black Butte Trail, which ascends Big Horn Peak most directly. Specimen Creek. On Highway 191 as it moves into the park a little bit. This trailhead provides access to the Specimen Creek Trail and ultimately to Sheep Mountain and the Sky Rim Trail. A lower junction connects to the Sportsman Lake Trail, pointing you back toward Mammoth Hot Springs for longer shuttle backpacking trips. Bacon Rind. On Highway 191 inside the park but accesses USFS trail 176 down Bacon Rind Creek. It connects to the Fawn Pass Trail, but use the Fawn Pass trailhead instead. Fawn Pass. On Highway 191 just beyond Bacon Rind, with access to the Fawn Pass Trail and the Fan Creek Trail. Both head into the heart of the Gallatins, aimed ultimately at the Mammoth Hot Springs complex. Bighorn Pass. On Highway 191, with access to the Bighorn Pass Trail through the heart of the Bear Management Area. This section is very incomplete and outside my experience. Information appreciated. Hyalite Creek (thanks to Bob Sihler). From Main Street in Bozeman, head south for about 7 miles on South 19th until you reach the left turn for Hyalite Canyon Road (Route 62). About ten miles of pretty driving takes you to Hyalite Dam and Reservoir, where there are nice views of the mountains. Beyond the dam, the road is unpaved, but it's passable to passenger cars-- just avoid the left branch at the far end of the reservoir, along which you will wish for high clearance if you don't have it. Drive a few more miles until the road ends at a large parking area, and this is where the trail up Hyalite Creek begins. For regions inside Yellowstone, you must pay national park fees. There are various options, including an annual multi-agency pass for all federal lands. Backpacking sites require permits. You can reserve these in advance using information here. Yellowstone's backcountry is surprisingly underused, but popular sites go quickly. Most of the Gallatins inside Yellowstone NP are part of the Gallatin Bear Management Area. From May 1 to November 10, off-trail travel inside the BMA is prohibited. This rules out ascents of a number of peaks, including Joseph Peak, Gray Peak, Little Quadrant Mountain, Bannock Peak, Antler Peak, Three Rivers Peak, and Echo Peak. Dome Mountain is on the boundary of the BMA, so your approach would determine whether you can climb it. I am not aware of required permits inside the Gallatin NF, but that could change at any time. Some trails in the Hyalites are open to mountain bikes and motorbikes Sunday through Thursday from July 16 to September 4. From September 5 through July 15, the trail is open to hikers, horses, mountain bikers, and skiers every day. Yellowstone National Park official site. Gallatin National Forest official site. I’d like to thank Joseph Bullough, the original owner of this page, for his earlier work on it. I'd also like to thank Bob Sihler, especially for his help on the Northern Gallatins.